Here are examples of custom Christmas stockings that I've knit with angel pictures on them. Most of the angel pictures I've seen on stockings are more cute than majestic. They can be done with several colors, but a single color is sometimes most effective. 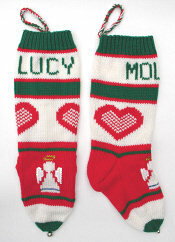 Please look to see what Customers Say about stockings I've knit with angel pictures. A large candy cane shares space with a simple angel in a brightly trimmed dress. Either design could fit into a number of stocking designs. The customer chose darker, more Victorian shades of red and green for this unique angel design. The wings are knitted in angora yarn, so they're very soft and fluffy. Front view of stocking in darker shades. This colorful little angel could be used in a variety of stocking designs. This sweet angel was knitted in angora for a little girl who loves soft things. I like her even better on a green background. The snowflakes add a nice touch. This little angel has hair and eye colors to match Hadley's. The unusual cursive name style and the stripe pattern ensured that the new stocking fit in with the existing family stockings. This majestic angel is slightly off-center with a large star above the right wing. A side view shows the rest of the angel's left side. You can also see here the way the green stripe extends through the textured heel. This wide-eyed angel is more colorful than most. She could also be knitted with dark hair and eyes, or different skin color. She might look nice on a blue background, too. These sisters got matching stockings in jewel-tone acrylics. I have also knitted this heart with the colors reversed. The simple angel is adorned with a golden halo, blue sequins on her dress, and iridescent white sequins on her wings. The stripes add interest without overly complicating the design. 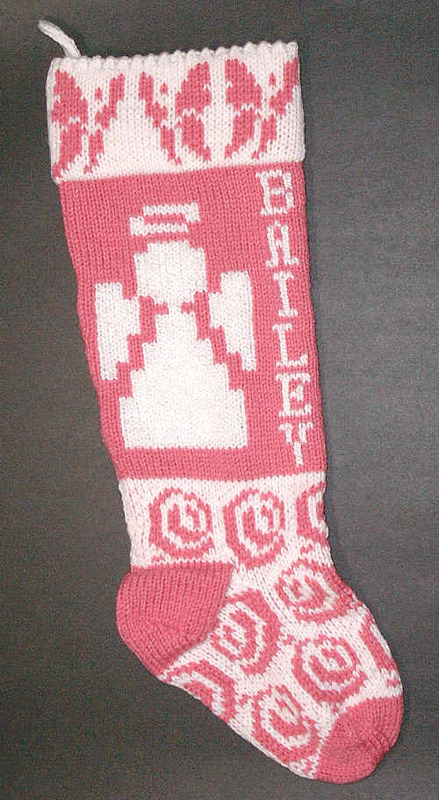 This unusual design was a custom Christmas stocking for the first baby girl in a family with several boys. 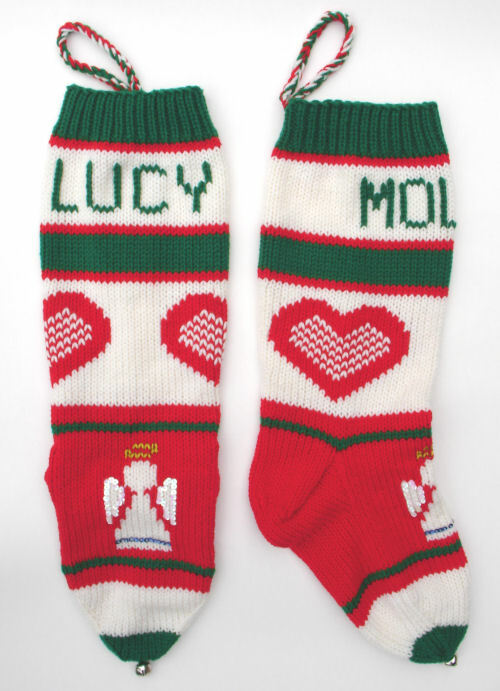 If you're interested in a stocking with angel pictures, find out more about ordering custom Christmas stockings.